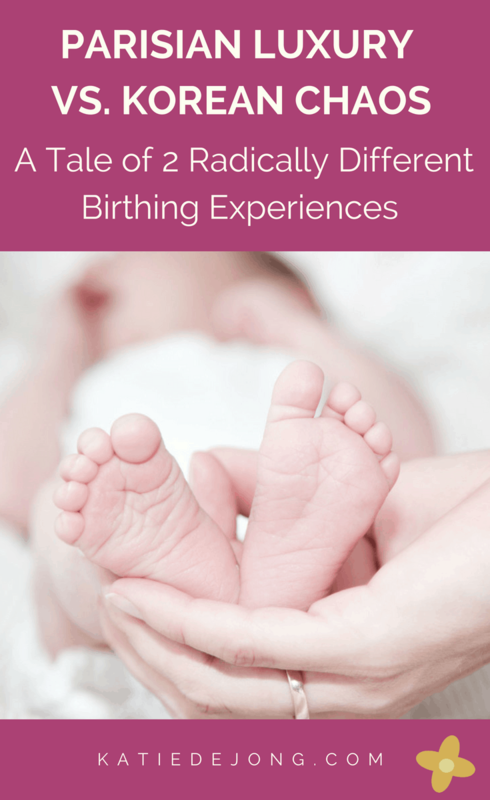 From the luxury and comfort of a French maternity hospital to the hustle and chaos of a South Korean birthing clinic, my two birthing experiences couldn’t have been more different! I hadn’t quite realised at the time just how spoilt I was to be giving birth to our first child at the American Hospital in Paris. We’d been posted to Paris for my husband’s work for two years when I was six months pregnant back in 2011. 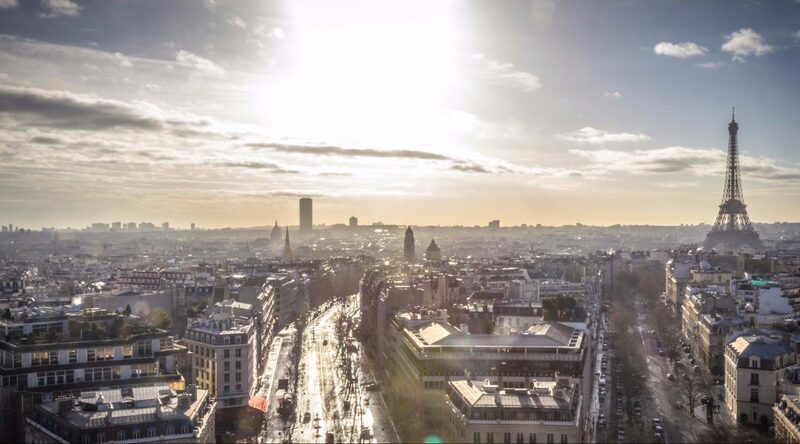 Moving to the City of Love, home of crispy baguettes, aesthetic beauty, fashion, and delicious pastries was a beautiful opportunity that we were super excited to undertake. When we first arrived in Paris our highest priority was, of course, finding somewhere to give birth. My husband’s colleagues all highly recommended the American Hospital (L’Hôpital Américain de Paris) and, not knowing any alternatives and having limited time to explore them, we promptly booked ourselves in for an intake appointment with a lovely American obstetrician at the hospital. She made us feel completely at home and comfortable with giving birth there, which as nervous first-time parents was a huge relief. Despite the fact that we sometimes had to wait in her waiting room for up to three hours for appointments and that it was a one hour bus ride from central Paris where we were living, we felt it was worthwhile sticking with her given her impressive track record of delivering babies, her friendly and comforting style and the positive word of mouth feedback that we consistently heard from friends and colleagues. Our mastery of the French language when we first arrived in Paris was sketchy to say the least, so it was a relief to find a native English speaking obstetrician. She was the only such native English speaker we were to come across at the hospital, despite the name ‘American Hospital’. The hospital was formed in 1906 as a place for American residents to get American-trained medical care in their own language. The hospital treated Allied soldiers in both World Wars I and II, with many surgeons and doctors playing an active part in the underground Resistance in WWII. Brave doctors helped soldiers recover from war wounds and then be smuggled out of German-occupied France with the help of Resistance workers, instead of being held as POWs in Paris (the hospital played a fascinating role during WWII, rich with both inspirational and tragic stories). However, over time the hospital has evolved into more of a ‘standard’ French hospital, with predominantly French physicians and nurses and these days English speaking service is hard to come by. But it’s still one of the best maternity hospitals that can be found in Paris these days and we were very lucky that our insurance covered our stay there. So, during the birth of our first little boy Jack, we struggled by in our limited French and the midwives struggled by in their limited English, but luckily the similarities between French and English are just enough to be able to pick up the gist of what’s being said. While at the time we thought we’d struggled with a large language barrier in France, we later came to realise what a real language barrier feels like while giving birth in South Korea! The French have quite a beautiful birthing philosophy. Not having given birth anywhere else before I have nothing to compare it to of course, but now having given birth again in South Korea I realise that the French approach is centred around immediate bonding with the newborn child. Directly after I’d given birth, our baby boy Jack was put on my chest and allowed to stay there for around 20 minutes, giving him a chance to try suckling for the first time, which he took to like a natural. When we’d had a chance to spend some quality time with him, admiring his little hands and beautiful face, the nurses asked if they could take him to give him a bath and do some quick tests. After that, they dressed him and put him into a little bed on wheels and we were all taken back to our private room, where we were left to enjoy ourselves as our new little family of three. The staff did their best to allow us maximum privacy and family time. We had a buzzer we could press if we ever needed anything. The service and after-care at the American Hospital resembled a five-star hotel more than a hospital. The rooms were large, spacious and modern, with a super comfortable reclining bed with remote control, making it easy to adjust your position up or down to sleep or feed. The bathrooms were spacious with a large, hot shower. We had a television in our room, a fridge, a space to change and care for the baby and a mattress was organised so my husband could spend the nights with us in hospital. Perhaps the most amazing thing about the stay in hospital was the food. We all know the French love their food, and this hospital was no exception. We were brought three course meals three times a day, including exotic dishes such as Cordon Bleu, roast beef and vegetables, steamed salmon and roast potatoes, always with a delicious soup and dessert to go with it. And on top of that, the kitchen staff provided the breastfeeding mothers with an extra supply of yoghurts and cheeses to keep us going during the night feeds – so good. We were allowed to stay in hospital for five days and with no extended family around in Paris to help (my mother would arrive two weeks later), we decided to take full advantage of these five days to rest and recover. We were definitely in no rush to leave, given the amazing care we’d been receiving from the sweet and caring nurses, the regular follow up visits from our obstetrician and the excellent food. Then nurses took great care to help me get my breastfeeding established smoothly during those five days which was a great help, given some of the initial teething problems I had. Both my husband and I felt strangely sad on the fifth day when we had to go home, after such a sweet first birthing experience. Fast forward almost three years and now we’re based on Geoje Island in South Korea, a small island with a large shipbuilding industry, containing two of the largest shipbuilding yards in the world – Samsung and Daewoo. Given the high demand for workers here, many thousands of expats have flocked here to support the fast-paced, high-tech engineering and construction projects underway on the island. So despite its fairly remote location (located off the south-eastern tip of South Korea), there’s a surprisingly high number of bars, cafes, restaurants, and facilities for foreigners and a thriving expat community, which makes it quite fun to live here. Not to mention the beautiful scenery and easy access to great hiking trails, cycling, kayaking and picturesque beaches. But perhaps the nicest thing about living in Korea is the friendly, kind and welcoming nature of the South Korean people. Always smiling, nodding and bowing, the South Koreans are an innately happy and friendly people, seemingly always ready to welcome foreigners into their world (a different experience to Paris on that level!). I gave birth to our second baby boy Lio in a birthing clinic called Elle Medi in downtown Gohyeon (one of the two main towns) on Geoje Island. It’s quite unique how things are set up here. The birthing clinic is on level 5 of a multi-story building on the main, busy shopping street. On the ground floor is a large electronics shop selling Korea’s famous brands such as LG and Samsung, on the second floor is a pizzeria and a dentist, on the third floor a dermatology and skin clinic, and then on level 4 a post-birthing clinic where mothers can go to rest and recover while having their babies cared for in a nursery as needed (the Koreans pay top dollar for this service, which includes pampering services such as massage and pedicures for the mothers). So in contrast to the western world where maternity wards are generally part of a larger hospital on private hospital grounds, here in Korea the birthing clinics can be found on the main shopping strip, mixed in with a host of other non-maternity related shops and services. It felt quite bizarre to be stepping into the lift to go to give birth while others were entering the lift with their hot pizza boxes or heading to their dental appointments. Perhaps the first experience that let us know things were going to be different was when we were led to a small room behind the reception area of the birthing clinic to be admitted as an in-patient, once it had been confirmed I was officially in labour. This tiny room was where I would eventually give birth later that evening. The first thing my husband noticed was the hair all over the floor. Bless the Koreans, I love them so much, but their hygiene standards definitely are different to ours! My husband insisted that someone come in straight away to clean up all the hair on the floor as we prepared to bunker down for delivery. A cleaner appeared immediately with a wet mop, and seemed to push the (now wet) hairs around rather than actually clean them up. Sigh. But it was going to have to do. There’s nothing that makes you angrier while giving birth than being told to be quiet! Within minutes (of extreme pain that I’ll thankfully never have to experience again) our beautiful second baby boy was born. After my husband cut the umbilical cord I was allowed to hold our little Lio briefly. But within two minutes he was whisked away off to the nursery for testing and the standard Korean procedure for many birthing clinics: 4 hours in a 37 degree Celsius incubator. Even if the birth has gone smoothly and there is no reason to suspect any issues, all babies are required to spend the first four hours of their life in an incubator. We couldn’t quite understand the point of this (that language barrier again), and we were told they would bring our baby to our room at midnight (he was born at 8PM). Given that I’d only seen him for 2 minutes, I couldn’t bear the thought of not seeing him for four hours. And it felt wrong for him to be in an incubator by himself when he’d been snug in my womb for nine months. We were allowed to look at him through the glass window of the nursery, and we could see him lying in the small Perspex incubator, flapping his arms and legs about and searching around with his head. It broke my heart; I wanted and needed to be holding him. We approached the nursery staff and asked them if we could take him out of the incubator, at which point we were told “no” – we could have him at midnight. My husband entered a full-blown negotiating procedure, trying to bargain his release at 10 PM. They insisted that the hospital procedure required them to keep him there for 4 hours. We walked away and discussed the situation, gradually getting more and more angry that we weren’t able to hold our precious baby. We agreed to walk back and insist we take him out; he was our baby after all! After more resistance on behalf of the nursery staff. I think they sensed I was going to explode or make a scene if they didn’t release our baby. After lots of emotional sign language back and forth, they finally agreed to let us have him within 10 minutes. The relief I felt when I could finally hold him again was huge; it even seemed like Lio breathed a big sigh of relief himself, his short, quick breathing settled down and he quickly started purring with satisfaction. The night in the hospital was tough. After delivery, we were transferred to a tiny room where we would spend the night. It had a bed, a small table, a tiny bathroom with a toilet and a shower hose next to it that you couldn’t use without drenching the entire bathroom (which was probably 1 x 1.5 m wide). It’s the Korean tradition to sleep on the floor in their homes, with only a small rubber mattress under their bedding, so they’re accustomed to very hard beds. The hospital bed was a simple single bed, rock hard, with a single hard pillow, making it almost impossible to prop yourself up to breastfeed. After the pain and discomfort of labor I was in need of some deep rest, but I couldn’t find a single comfortable position on the bed to get myself into sleep at all. So I spent the night listening to our baby boy’s breathing and purring, feeding him every 2-3 hours propped up uncomfortably on my hard bed, and being interrupted every few hours by nurses coming in to check blood pressure, temperature and take blood samples. I was an exhausted wreck the following morning. I realised the next morning that I was one of many mothers who had given birth in recent days. It was a small birthing clinic with probably only around 10 small rooms, and it seemed each room was full. The clinic was hustling and bustling with post-labour mothers walking around with their saline drips attached; it’s custom in Korea for everyone admitted into hospital to be hooked up to a drip no matter how mild their condition, so it’s a common sight to see patients walking around pushing their drip poles in front of them. It makes it really hard going to the toilet and changing clothes while being constantly attached to a drip. Lio was taken for several tests the following morning, and we were even required to take him in the car for an appointment with an English speaking paediatrician several blocks away for more tests, given that the in-house paediatrician spoke no English (damn that language barrier again!). So we bundled him up and prepared him for his first car trip at only 12 hours old. My husband took him off to his appointment while I stayed behind and watched some of the scenes in the nursery. Given how soft, courteous and friendly the Koreans are in public life, I was surprised to see how rough the nurses were with the newborn babies. They picked them up and roughly propped them on their shoulders, pushing a bottle in their mouth if they fussed, and pulling their clothes on and off with no tenderness. To settle them they thumped the babies on their backs with what looked like considerable force. We’d experienced this style previously when our two-year-old son Jack was in hospital here in Geoje with a broken leg; there was no cooing or gentle sweet-talking before the required interventions they needed to undertake. They would simply launch into a blood test or medical procedure without any of the friendly and comforting communication we’re used to from staff in western hospitals, leaving Jack with quite a bit of trauma and dislike of doctors and nurses. Hospitals here and the medical profession seem to be very business-like, with staff getting on with their jobs as fast and efficiently as possible. Efficiency seems to be the most important goal – not patient comfort. Needless to say, we wanted to get home as fast as possible after delivering Lio, back to the comforts of our own home. In contrast to Paris where we didn’t want to leave the hospital, we couldn’t get home fast enough this time around. Fortunately, our birth went smoothly and I was recovering well, so I was able to be released within 24 hours, even though I was warned that Korean insurance would not cover me for medical problems if I left before the required minimum of 48 hours. We considered it worth the risk. So how would I summarise the Korean birthing experience? In one word – interesting. The most important thing was that the level of medical expertise was high and our baby was delivered safely and smoothly. The doctors and nurses were highly trained and knew exactly what they were doing. At the end of the day, that’s all that matters. All the rest is of secondary importance, and well – not important at all really. We’ve had beautiful weather the past 10 days since our beautiful little boy was born, and so we’ve ventured out a few times already for a walk and a coffee, with our little man rugged up in his winter clothes. We’ve definitely shocked a few of the local Koreans, getting out and about with such a small baby. In Korean tradition, all Korean mothers should stay indoors for at least 49 days, eating only seaweed soup and rice, with the indoor heating turned up high. While the new mothers are allowed to bathe their lower half for medical reasons, they’re not allowed to shower for at least 49 days. The baby isn’t allowed out of the house for at least 100 days. So when the locals see our little less-than-two-weeks-old baby out for a walk or sleeping in the cafe while we sit and enjoy a cup of coffee, we get many surprised looks ranging from shock, disgust and disbelief to amazement and wonder. It’s definitely a big point of difference between our cultural conditioning! I find it so interesting to observe what’s considered ‘normal’ within different cultures, depending on the traditions and practices we grow up with. So from Paris to Geoje Island, my two little boys have come into this world in completely different ways within contrasting cultural settings. It’s been fascinating to observe the way things are done so differently in different places. In closing I extend my heartfelt gratitude to our wonderful obstetrician Dr Lee at the Elle Medi clinic for his great job in delivering Lio safely into the world, and all the other staff who helped us with his smooth arrival into this strange and fascinating world. With an international start to life, I wonder what other adventures await our little boys as they grow up. If you enjoyed this article, please comment below or share with your friends using the social media buttons below! I Will soon move to Geoje island with my husband and my two years old kid. I will for dure Deliver a new baby in Geoje so I Found very interasting your article. I had a wonderful experience givi gli birth my son in Italy …so i’m a little warry of what is giunge to happend with my second one. I need a good doctor that Will take Kare of my durino my second pragnancy in Geoje , do you have a doctor and a clinic to suggest me? Would you raccomand elle lady clinic for delivery? Are you stilo in Geoje island ? Hi Francesca! Thank you for your comment!